COLUMBUS, Ohio — You weren’t going to find tears in the Huskies’ locker room Sunday. You weren’t going to find sagging heads or players desperate for consolation. It’s not that their 22-point loss to North Carolina came without pain, but it paled in comparison to the season-long pride. Two years ago, the idea of Washington making it to the second round of the NCAA tournament was far-fetched if not outright absurd. Same with it running away with the Pac-12 title or winning 15 straight games at home. But the Huskies did all those things — reinventing their program and reinvigorating their fan base. How dejected could they really be? When Lorenzo Romar was fired as the Huskies head coach after that 9-22 season, it was uncertain if any of UW’s principal players would return. But Romar’s successor, Mike Hopkins, successfully re-recruited four members of this year’s senior class along with sophomore Jaylen Nowell. What ensued was a blend of individual and team success the Huskies hadn’t seen in close to a decade. Senior Matisse Thybulle broke the Pac-12’s single-season and career steals record en route to becoming the conference’s defensive player of the year. Nowell averaged 16.1 points and 5.3 rebounds en route to becoming the conference’s player of the year. 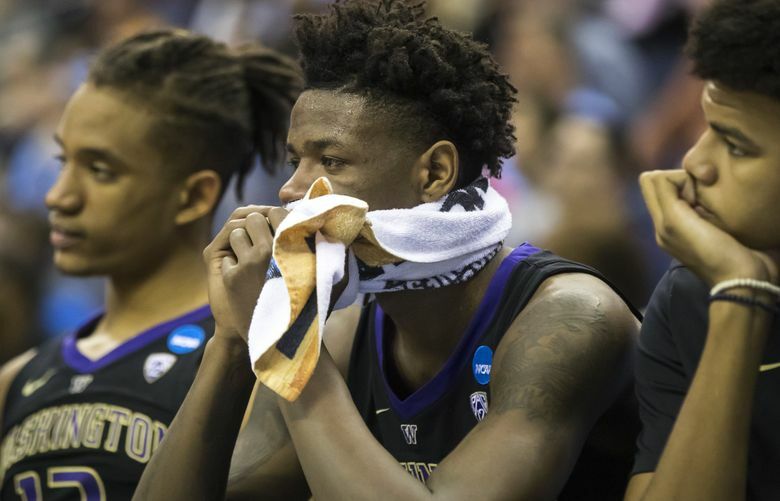 More significantly, after a trip to the NIT last season, the Huskies (27-9) breezed through the Pac-12, reached the NCAA tournament for the first time since 2011, and managed to beat eighth-seeded Utah State in the first round. So, even after Sunday’s 81-59 drubbing, how much heartache could they really feel? Based on their performance Sunday, it seemed as though the top-seeded Tar Heels would sweep a best-of-15 series against Washington. They outrebounded the Huskies, 48-24, constantly had them flirting with a shot-clock violation, and never let UW seize momentum. When Crisp knocked down a three-pointer to cut the deficit to five early in the second half, Carolina’s Cameron Johnson answered with a three nine seconds later to spark a 13-0 run. Save for the Tar Heels (29-6) suffering team-wide food poisoning, Washington never had a chance. But notice Dickerson’s use of the word “foundation” — because he was one of several Huskies to say it. Returning next year are will-be juniors Hameir Wright and Nahziah Carter, the former of whom started 26 games for UW this season, and the latter of whom scored in double figures 15 times, including twice in the tournament. The Huskies also will welcome five-star recruit Isaiah Stewart, and likely expand the role of oft-praised freshman Jamal Bey. The biggest question is whether Nowell will return for his junior year or try and play in the NBA, but if he does come back, there is no reason to think the Huskies can’t be just as good, if not better, than they were this season. Of course, between Arizona, USC and Oregon, the Pac-12 has three of the nation’s top 11 recruiting classes coming in (Washington is ranked 21st, according to 24/7Sports). Even if Washington improves, the road to repeating as conference champs can become rockier. But given the strides the Huskies have made over the past two years, have reasons to doubt them not grown sparse? UW fans might be glad to know that not everybody was in a reflective mode after Sunday’s loss. For players such as Carter, the sting of defeat will linger a bit longer. At this moment, are you thinking “Damn, we just lost,” or “Wow, look at the run we made”? Carter was asked. It’s normal for competitors to feel that burn. The Huskies’ success, however, should douse those flames. They might not be going to the Sweet 16, but that doesn’t mean this season wasn’t sweet. How quirky is UW coach Mike Hopkins? Let his players tell you. Matisse Thybulle's father might be UW's biggest fan. He's definitely the loudest.